This 253 acre parcel is the ultimate Costa Rica dream property. It has it all. It is located in the mountain above Uvita aprox 15 min from the paved coastal highway and another 5 min to the famous Whales Tale National Marine Park, one of the most beautiful beaches in the country. The road ends at the gated entry to this property so it is as private and exclusive as anyone could ever want. When you enter the gate you leave the world behind. Most of the acreage is covered in primary forest. When you think about Costa Rica, this is what you think about…..giant old growth trees, amazing mountain breezes, 360 degree views of mountains and ocean, rivers, waterfalls, and more wildlife and birds than you can imagine!! The ocean views from this property are nothing shy of epic. 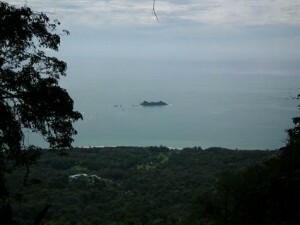 It spans from the Terraba river mouth and the Osa Peninsula to the south, it looks directly down on the Ballena Islands, and then to the north to looks towards the Whales Tale and Manuel Antonio and all year sunsets!!! The build able areas are on the front ridge and capture both the ocean and the mountain views. There are 2 large building areas and then a long ridge that runs parallel to the ocean and is perfect for guest cabinas. There is currently a very nice wooden home that has been built in one corner of one of the building sites. It is a perfect starter home while you continue to build. It would then make a great guest cabin or caretaker home!! There are also trails to the river where you will find a 100 ft waterfall!!! This is a unique property that captures all that Costa Rica has to offer!! If you are looking for the best of the best, than you want to see this! !